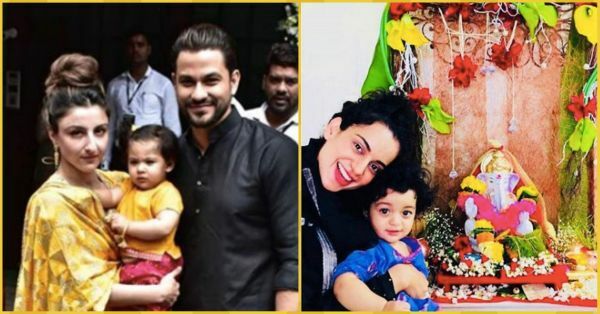 From Soha's Lil Darling to Kangana's Nephew, Bollywood Babies Celebrated Ganpati In Style! The entire country celebrated Ganesh Chaturthi yesterday and our Bollywood celebs also offered prayers to Lord Ganesha. As always, the kids of our stars stole the show with their cute expressions and traditional outfits. From Soha Ali Khan's darling daughter Inaaya to Kangana's adorable nephew Prithvi, the tiny tots of Bollywood won us over. Most of them made their way to Arpita Khan and the Ambani house for the festive celebrations. Take a look at these Bollywood babies who have taken over the internet! Mommy Soha Ali Khan & Inaaya are winning at twinning! The couple and baby Inaaya were seen outside, Arpita Khan Sharma's residence to seek blessings from Ganpati Ji. Ganesh Chaturthi is even more special for the Kapoor’s as three generations celebrates the occasion together. Post performing the aarti Tusshar posed with dad Jitendra Kapoor and Laksshya for a picture perfect moment. Amrita Arora with her adorable fam! Fashion photographer Dabboo Ratnani with his little army! We still couldn't find any cute picture of Taimur from yesterday's celebrations, but we did spot Taimur getting out from his car and going somewhere.